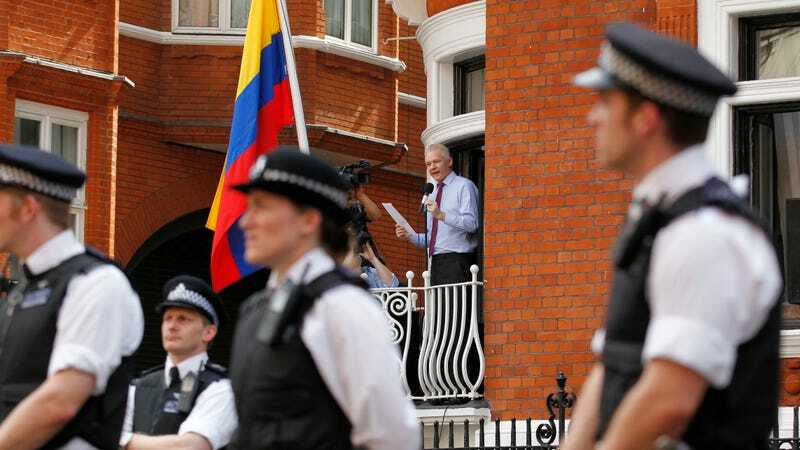 Wikileaks, the whistle-blowing organization which is now almost solely run by founder and fugitive Julian Assange from a small room in the Ecuadorian embassy in London where he is claiming asylum from the police, claims that one of its official stores has been taken down by cryptocurrency exchange Coinbase. The Coinbase store sold Wikileaks-branded merchandise including shirts, mugs, posters, and the other kind of generic stuff that remains available on a separate Wikileaks shop page. It also accepted a variety of cryptocurrencies. Wikileaks has begun calling for a boycott of Coinbase on Twitter, though with over 10 million reported users on the exchange, it is unclear whether that will have any noticeable impact. As the Verge noted, at the start of the decade, Wikileaks was fighting a similar battle with payment processing companies who decided to blockade the site after it published a series of US diplomatic cables in November 2010. That battle included some of the biggest names in finance including Visa, Mastercard, Paypal, the Bank of America, and Western Union, though court rulings eventually forced companies involved to resume processing donations. At the time, Wikileaks and Assange began exhorting users to finance continued operations via cryptocurrency, which allegedly could not be stopped—and indeed anyone can still donate cryptocurrency to the site, just so long as they don’t do it through Coinbase. While the impact on Wikileaks may be virtually nil for now, if more exchanges bail on the site, it may have difficulty transitioning what Assange alleges are its extensive holdings in cryptocurrency back to fiat currency he could use to pay for things—though with Assange’s presence in the Ecuadorian embassy now going on six years and counting, and his internet reportedly cut off at times, it’s not clear whether he really has that much going on right now anyhow.